Our latest handbill for our "Repudiate and Humiliate" campaign (see http://www.jpfo.org/alert20070711.htm ) is now available for download at the JPFO website ( http://www.jpfo.org ). In it, we hammer home the idea that the BATFE is nothing more -- and nothing less -- than a criminal organization. Think that's too harsh? We don't. Visit our "Boot the BATFE" page at http://www.jpfo.org/filegen-a-m/bootbatfe.htm , where you can find hundreds of documents and news articles that prove it. Better yet, order _The Gang_ at http://www.thegangmovie.com . This documentary shows and tells how bad the situation has become ... and how much worse it can become if we don't rein it in now. Download the ATF "Repudiate and Humiliate" handbill at http://www.jpfo.org/images02/handbill-atf.jpg . 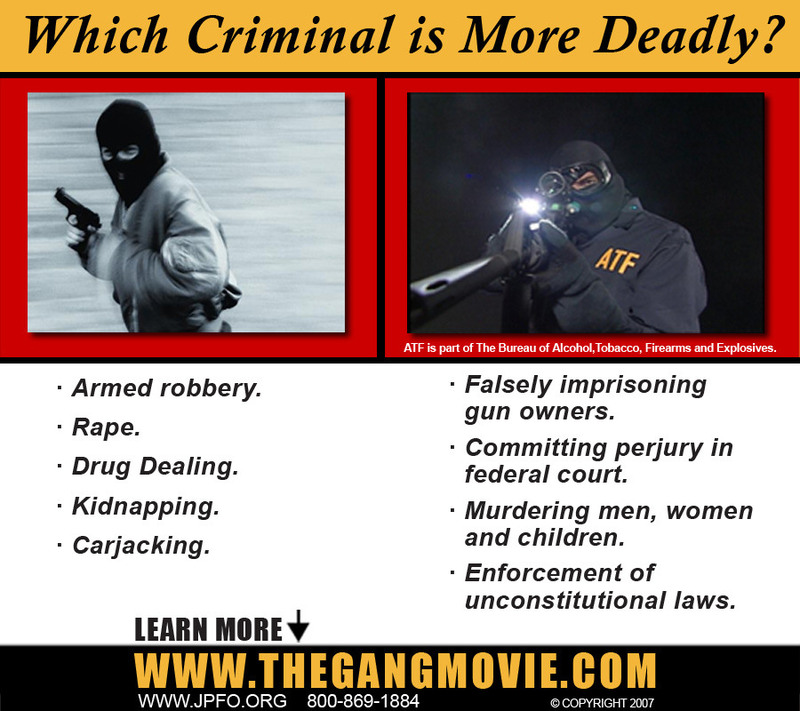 Distribute freely (for noncommercial purposes) and educate your fellow citizens about the dangerous rogue agency currently enforcing "gun control" laws. Remember, you can see all of our "Repudiate and Humiliate" handbills at http://www.jpfo.org/filegen-a-m/freebies.htm .